If you’ve holidayed in Fiji before you know how hard it can be to decide where to spend your vacation time. You would have spent a lot of time thinking about whether you should choose a family-style resort on the Coral Coast, one of the luxury international hotels at Denarau, perhaps an island in the Yasawa Group or even a remote getaway on the northern island of Vanua Levu. Making this decision requires a lot of weighing up of the facilities at each hotel, the variety of dining options located close by, whether the resort has a sandy (or coral) beach and an inviting pool, not to mention the various activities and day tours on offer. It can be really confusing. So why not take all the hassle out of your next Fijian holiday and book a small ship cruise aboard the Reef Endeavour. When you join a 3, 4, 7 or 11 night cruise aboard Reef Endeavour you won’t be restricted to just one resort; instead you will visit several different islands - each with a beautiful sandy beach - take in some of the country’s best snorkelling spots and meet the locals during authentic cultural activities. In fact each morning you will wake up in a new location ready for another exciting day of exploration. 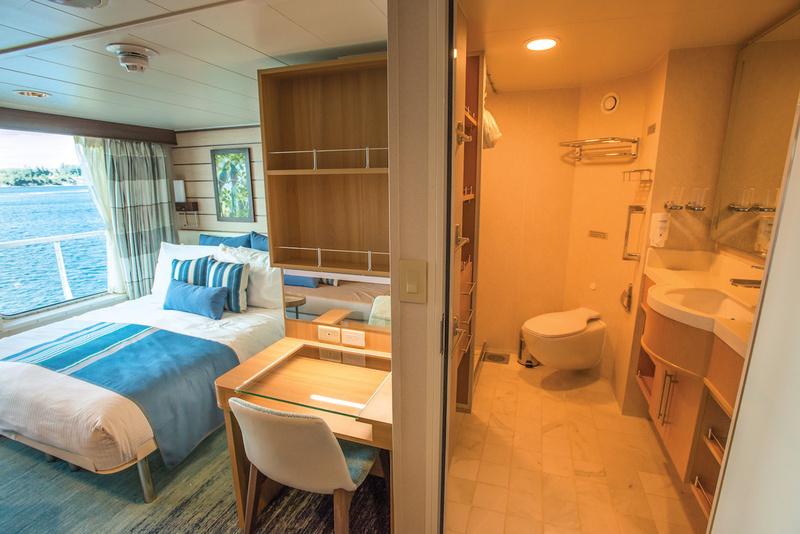 And, Reef Endeavour accommodates no more than 130 travellers on each cruise, so you’re guaranteed an intimate experience along with warm hospitality from the smiling Fijian crew. All your meals are included during the cruise, along with a range of exciting onboard activities to keep you, and the rest of your family, busy. You will have ample time for snorkelling and swimming, kayaking, cultural excursions and simply relaxing on a stunning stretch of white sand beach. And, you can do as much or as little as you like; it’s entirely up to you. 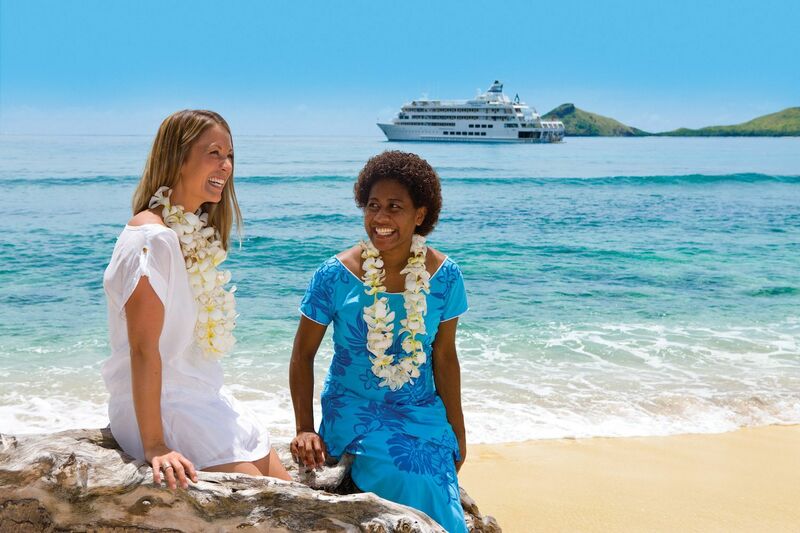 Reef Endeavour’s Fijian cruises depart year round from the Port of Denarau, close to Nadi Airport. The classic 7-night Yasawa Islands cruise departs on Tuesdays and Saturdays year-round and offers a total Fiji cultural and island experience. On this expedition you will discover the remote northern Yasawa Islands from Naviti to Yasawa, plus the southern Mamanuca Islands. Highlights include the famous Sawa-i-lau limestone cave and blue lagoon and rainforest walks with expert naturalists. There’s also plenty of time for snorkelling and beachcombing, along with some traditional Fijian cultural events. If you’ve been to Fiji before and think you’ve done it all, then think again! A couple of times a year Reef Endeavour offers a voyage of discovery to a part of Fiji rarely seen by tourists - the Lau Islands and Kadavu. 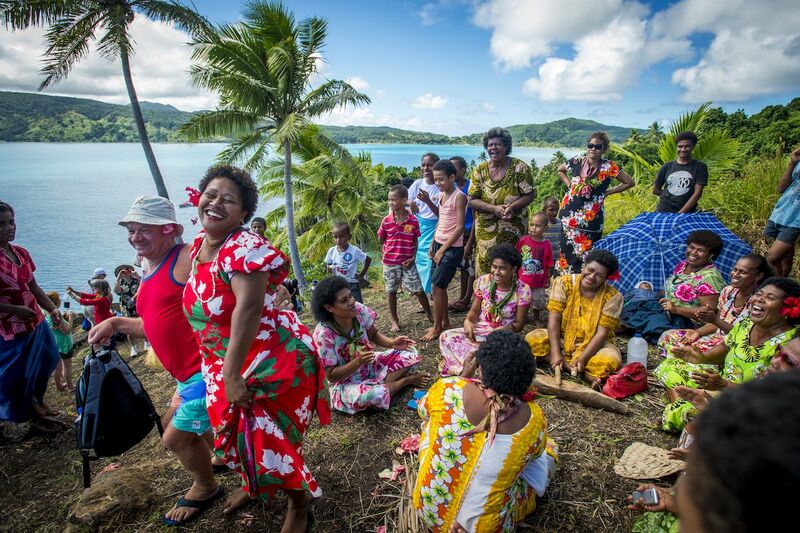 Departing from Nadi, this 11-night expedition showcases the culture and traditions of Fiji. 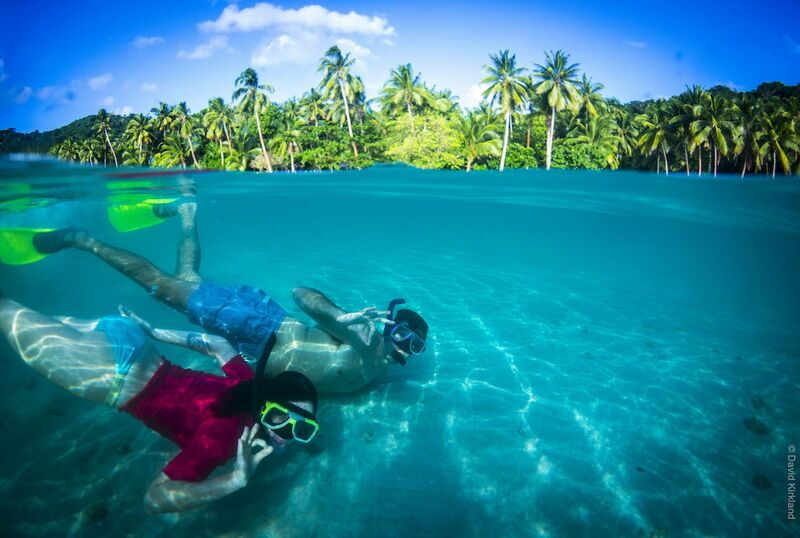 You will be able to explore pristine islands, swim, snorkel and SCUBA dive over colourful coral reefs in perfect lagoons and take long walks on rainforest trails leading to refreshing waterfalls. 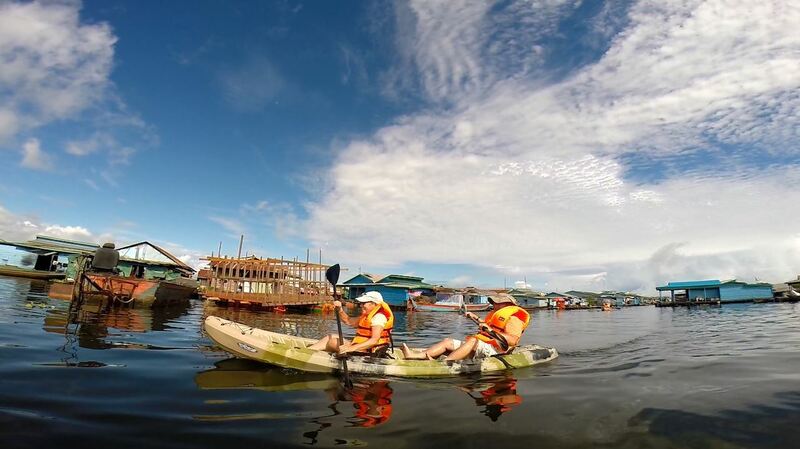 Most days offer the opportunity for in-water activities and cultural interaction. You will also be welcomed by the villagers and experience their happy islander existence. On Oneata Island witness the Sunday church service, the singing is sure to inspire. Marvel at skilled wood turners and discover islander heritage. Experience a traditional meke (dance), sevusevu (ceremony) and lovo (feast). This expedition showcases a different side of Fiji; away from the tourist crowds, where Melanesian cultures and traditions remain intact. 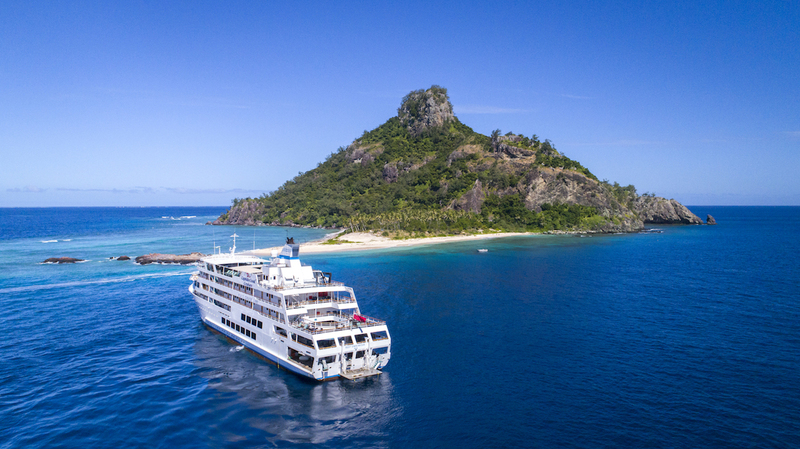 The 11-night Lau & Kadavu Discovery Cruise always sells quickly, and with 2018 and 2019 departure dates just released, it pays to get in early to secure your place. There’s currently some great Earlybird offers on Reef Endeavour Fijian cruising, with the 7-night Yasawa Islands cruise starting at just $2,716 per adult (ask us about special deals for any kids travelling!) and the 11-night Lau & Kadavu Discovery Cruise starting at $4,500 per adult – a saving of $1,125 off the normal price. These prices are inclusive of your shipboard accommodation, meals, most activities and offer excellent value for money. So whether you’re after a romantic Fiji getaway for two, or a holiday with the family, when you’re next thinking about a Fijian getaway give the expert team at Expedition Cruise Specialists a call on 1800 90 20 80 to discover more about some great small ship cruising options. Take a thrilling journey of discovery along one of Asia’s greatest rivers; the mighty Mekong aboard the luxury river ship Aqua Mekong. Over five or eight incredible days sail from Vietnam’s bustling Ho Chi Minh City (Saigon) all the way through to Cambodia’s colonial capital Phnom Penh. And, best of all, save 30% off normal prices when you cruise during the summer season between May and July. The longest river in Southeast Asia, the mighty Mekong flows over 4,000 kilometres from the Tibetan Plateau to the southeast, through Laos and Thailand to the equatorial flood plains of Cambodia and Vietnam, then finally into the South China Sea. 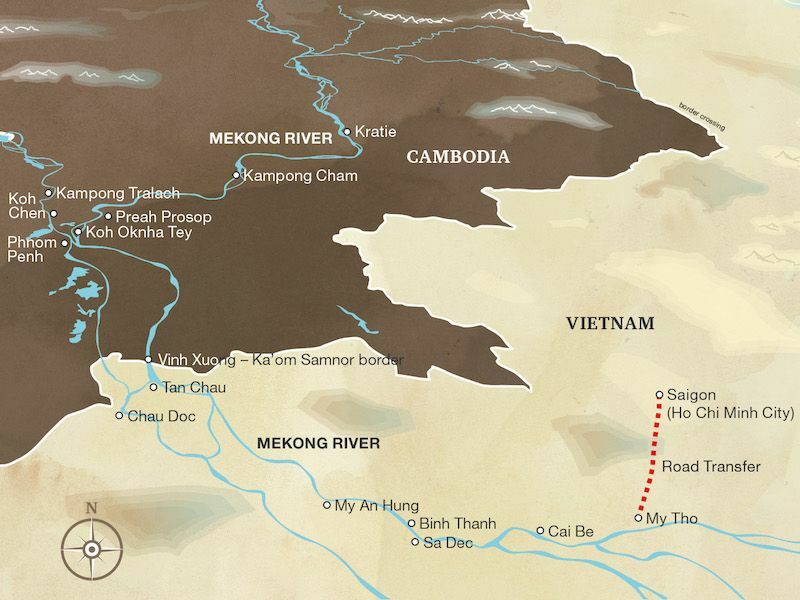 Two thousand years of human history can be traced back to the Mekong River. It is said that the rise and fall of the great Khmer civilisation responsible for the building of Angkor Wat was inextricably linked to the Mekong’s shifting tides. Today, around 60 million people live, work and play on the Mekong. Fish from the river comprise Cambodia’s single largest source of protein and it is rightly called the rice bowl of Vietnam, as it is on the fertile lands of the Mekong River Delta that the Vietnamese people grow half their nation’s agricultural product. The Mekong River is also a hub for Vietnamese culture and a major transportation route for villagers living in the Delta. From floating markets selling fish, coconut candy, tropical fruit, vegetables and flowers to bee farms that line the river, the Mekong throbs with activity from before sunrise. Why visit the Mekong in the Summer Season? The month of May on the Mekong officially kicks off the planting season (known as Royal Plowing Day) on the 24th in Cambodia and Vietnam. Royal Plowing Day marks the beginning of rice-growing season in Southeast Asia. This time of year on the Mekong is known as the ‘green season’ with 30-minute gentle rains each day that nourish lush landscapes. 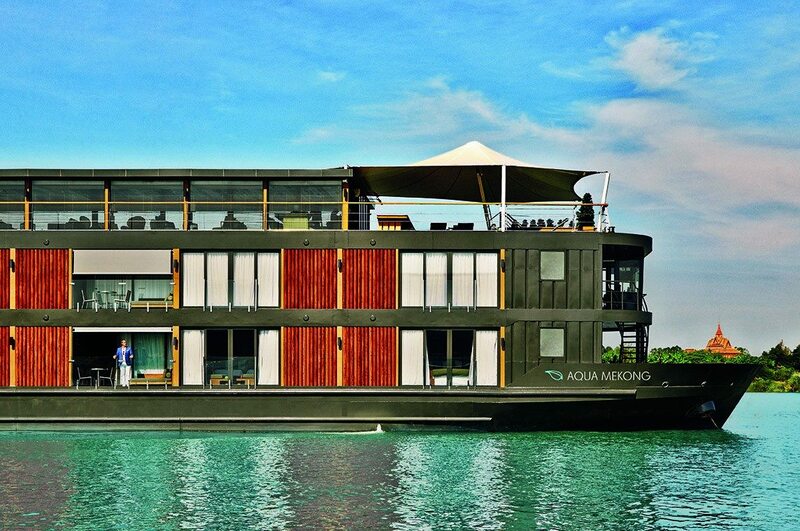 While cruising aboard the spectacular Aqua Mekong, guests wake up every day to verdant riverbank views and landscapes rich with tropical greenery drifting past their suites’ floor-to-ceiling glass windows. Even when it rains, as it does throughout the year, the Aqua Mekong’s tenders and water-based excursions remain extremely comfortable during these usually short cloudbursts. Rainy season arrives in May and lasts through October. This actually creates the high-water conditions that allow the Aqua Mekong tenders to cruise deeper into Vietnam’s emerald flooded forest, to Cambodia’s Tonle Sap Lake and along otherwise inaccessible yet fascinating tributaries. Despite the name, rain only falls around half an hour each day and usually in the afternoon. Excursions from the Aqua Mekong are timed so that cocktail in hand, guests may soak up the timeless romance of rain on the river while comfortably under cover. The 62 metre Aqua Mekong was designed by Saigon-based architects at Noor Design to embody the aesthetic of a sophisticated five star hotel. 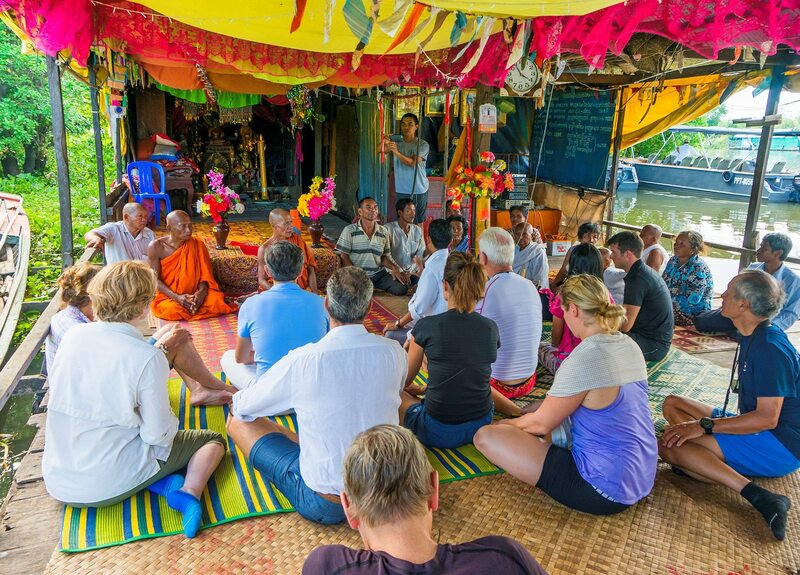 Local sustainable materials and artisanal touches are designed to welcome guests in the utmost comfort between on and off shore excursions along this fascinating river. Spacious and indulgent, yet intimate enough to feel entirely exclusive, the Aqua Mekong incorporates relaxed yet refined lounging and dining areas, and can accommodate a maximum of just 40 guests plus crew. Modern navigation technologies and the highest cruise ship standards as well as an experienced river pilot and crew ensure smooth travel and safety on the water. All guests travelling on board Aqua Mekong cruises during the 2018 & 2019 Summer Seasons will receive 30% off their all-inclusive cruise rates. 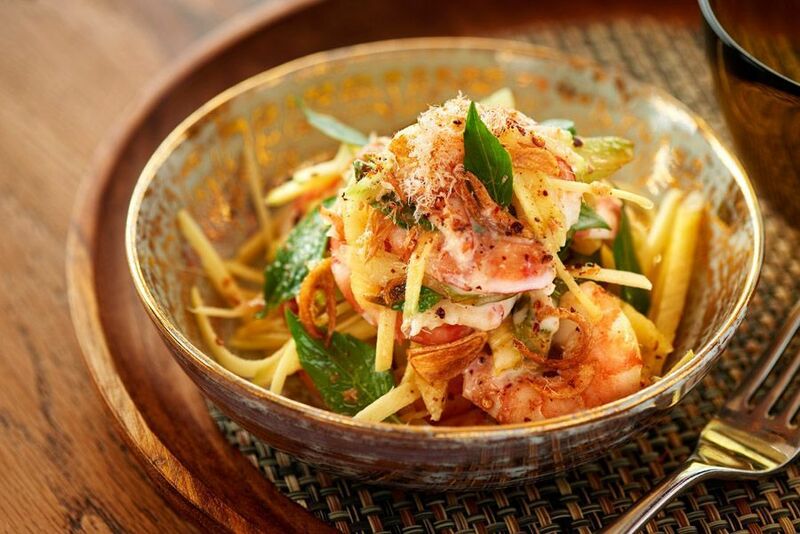 Click here to see more about the Aqua Mekong. For more information and to book your place freecall 1800 90 20 80 today (or +61 7 4041 2101 if calling internationally). National Geographic Quest launched - See the first photos! 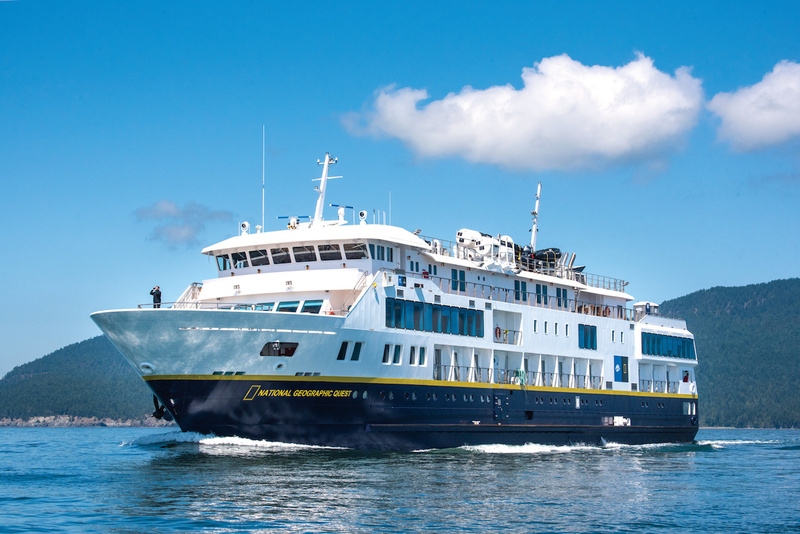 Lindblad Expeditions’ new, 100 passenger expedition ship National Geographic Quest departed on its inaugural voyage earlier this week, and some of the first photos of the ship's stylish interior have just landed on our desk. 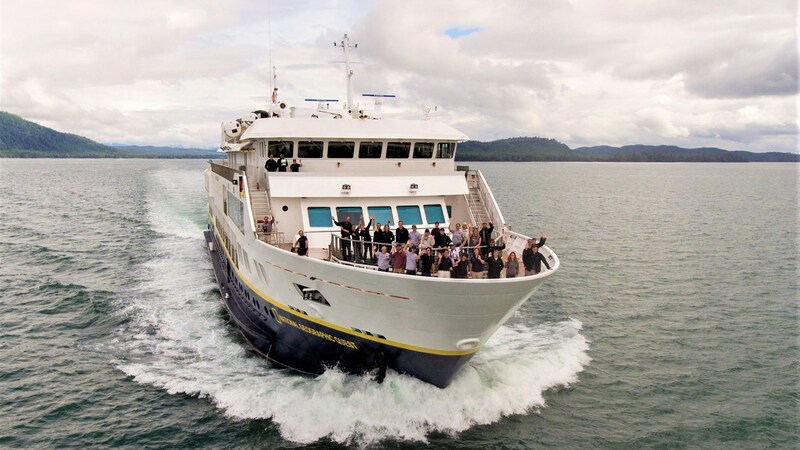 The first of two new, state-of-the-art expedition ships to be built near Seattle for Lindblad Expeditions (sister-ship National Geographic Venture launches in 2018), Quest will operate in Alaska over the northern summer, before heading down to the tropical climes of Panama, Costa Rica and Belize over the cooler winter period. Lindblad Expeditions has always been a pioneer in the field of expedition cruising, and National Geographic Quest achieves some notable firsts for this leading expedition company. 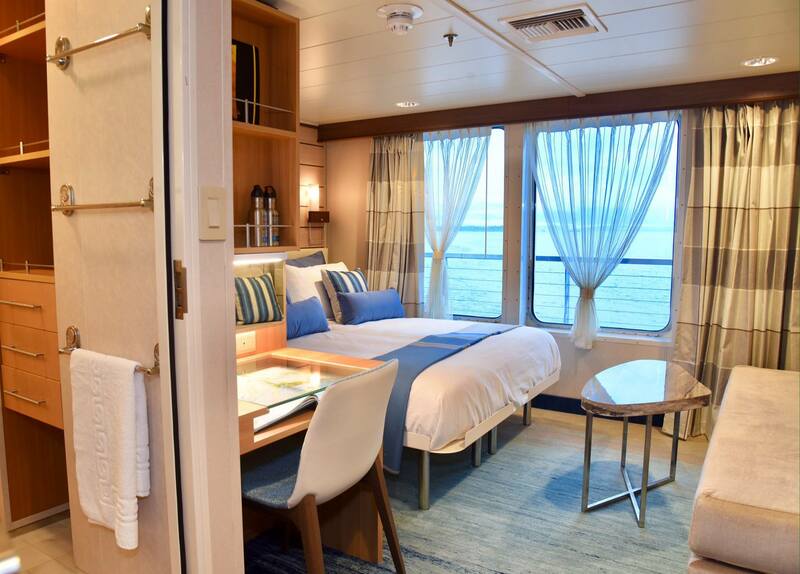 She will be the first ship in their fleet voyaging in these geographies with step-out balconies (available in 22 of the 50 spacious cabins), plus six sets of connecting cabins for families and groups; and a designated mudroom for expedition gear. The lounge is the heart of the expedition community, where cocktail hour and Recap are held each evening. It’s also where you’ll gather for presentations, photography talks, and guest speaker presentations. Seating design takes advantage of the wraparound windows for an optimal view, and boasts multiple high-definition screens for slideshows and videos. 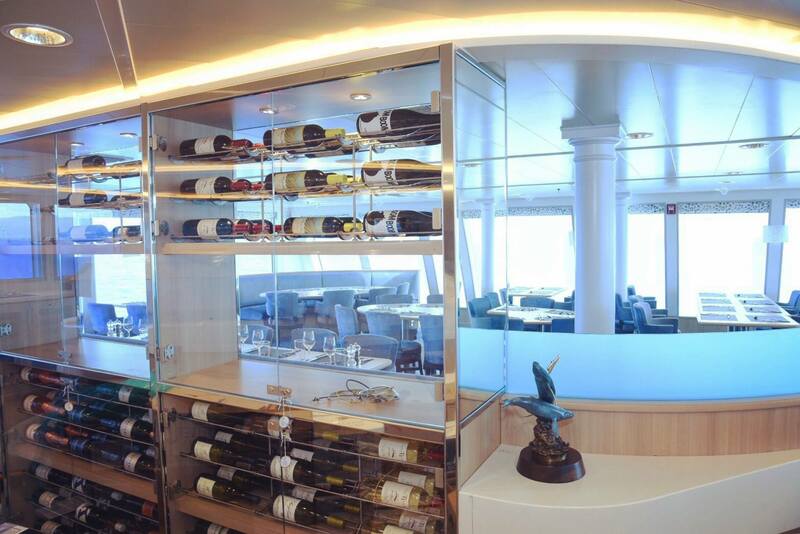 Forward lounge doors provide direct access to the bow. There’s also a small reference library and board games and cards are also available. Conveniently located on the lounge deck, the fitness centre is outfitted with two treadmills, exercise bikes, elliptical machines, exercise bands, and sets of small hand weights to use as well. 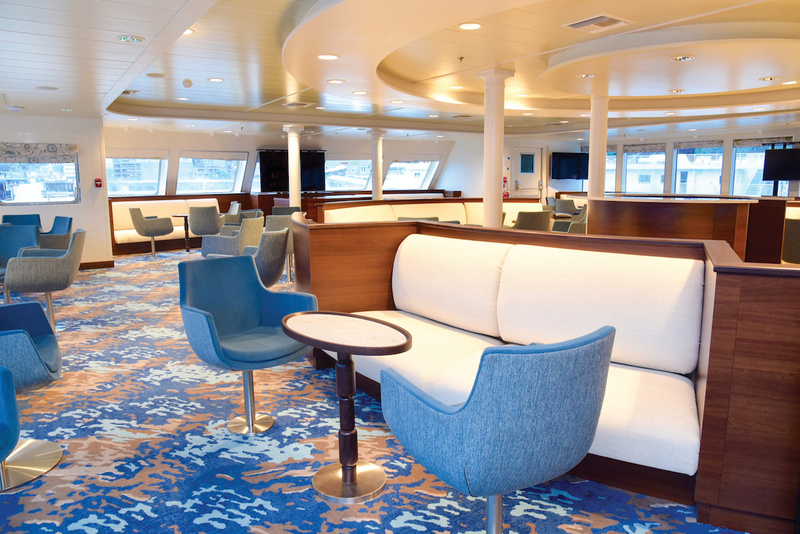 Morning stretch classes are held in the open air of the sundeck, located aft on the observation deck. After stretch class the deck is set with tables and chairs, and lounge chairs. 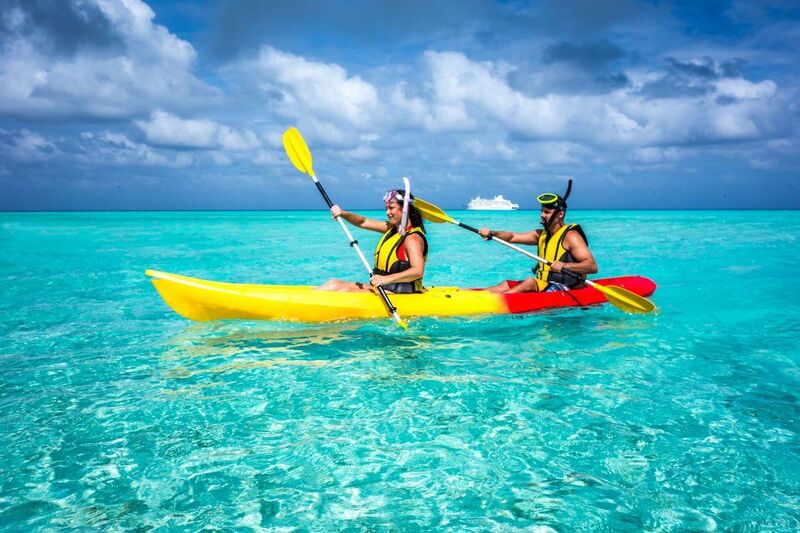 National Geographic Quest comes equipped with a fleet of 24 sea kayaks, paddle-boards, snorkelling equipment, and Zodiacs - fast, light boats that can be used to explore remote areas. It will also have a remotely operated vehicle (ROV), video microscope, and a hydrophone and bow-cam designed to film and record the underwater world. National Geographic Quest Guest is an ideal platform for discovering the fast-moving channels and shallow coves of Alaska and the Pacific Northwest and for exploring the tropical waterways of Central America. For more information, and itineraries click here. Over the next year or two we’re going to see some exciting additions to the world’s polar fleet, with two of our favourite ‘ice operators’ launching new vessels for Antarctic and Arctic waters. In the first announcement, Oceanwide Expeditions revealed the latest addition to their fleet – M/V Hondius – a little while ago, with the first expeditions due to take place in 2019. A full schedule for the ship has not yet been announced, but we’ll be sure to let you know about the voyages as more information comes to light in coming months. Hondius is the first new vessel to be built to class ‘LR PC6’, meeting the latest and highest demands of Lloyd’s Register for Polar Class 6 expedition ships, the highest Polar Class notation for ice-strengthened vessels. 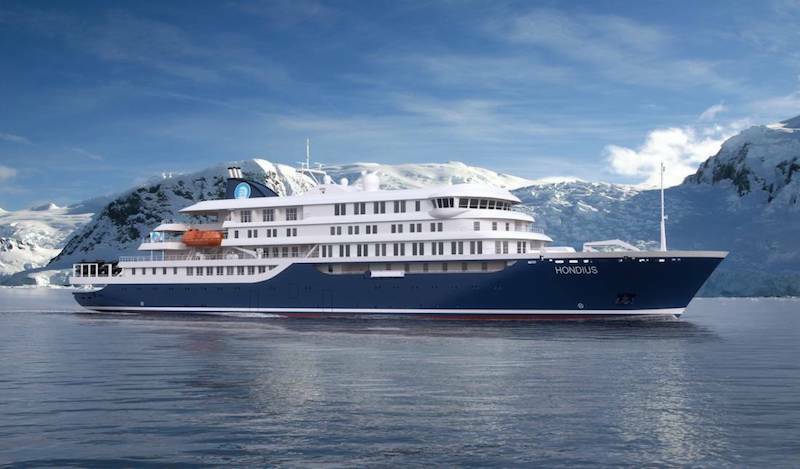 At just over 107 metres in length, Hondius will cater to 178 expeditioners and 76 staff. Although we’re often loathe to recommend ships of over 100 passengers in Antarctica (to maximise excursion time), the team at Oceanwide have done a lot of planning to ensure sea legs are short and to focus on fast and effective access to shore and near shore activities for all nature and wildlife-minded explorers. A powerful fleet of zodiacs will guarantee quality outings and swift landing operation for all passengers at the same time. 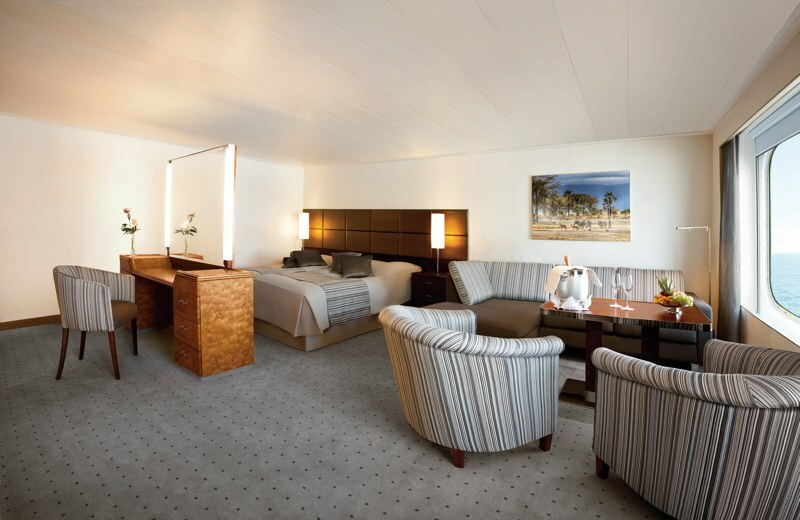 Hondius will offer deluxe accommodations for in total 178 travellers in one spacious Hondius suite (cabin size 33 m2), six grand suites with balcony (cabin size: 29 m2), eight junior suites with French balcony (cabin size: 22 m2), eight superior cabins, (cabin size: 22 m2), 11 twin deluxe cabins, (cabin size: 22 m2), 14 twin window cabins (cabin sizes: 14 to 16 m2), 30 twin porthole cabins, 2 triple porthole cabins and 4 quadruple porthole cabins (the porthole cabin sizes vary from 13 till 16 m2). 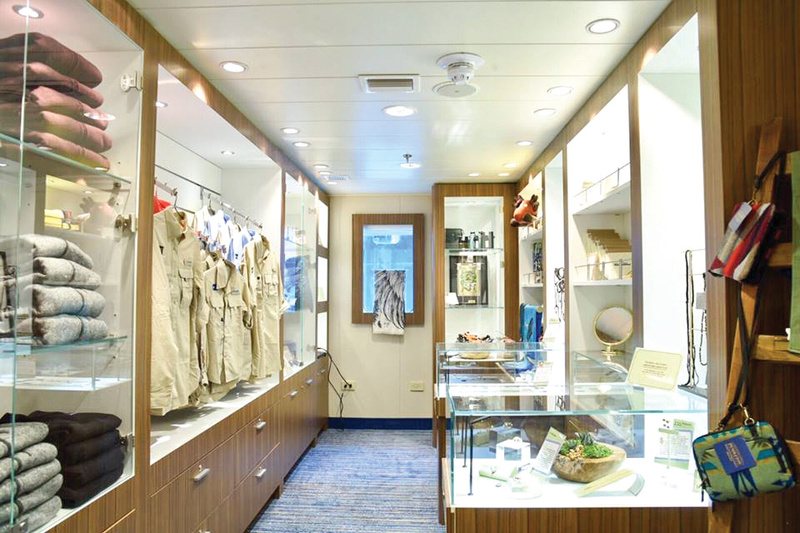 A large component of the Oceanwide Expeditions experience is education, and the ship’s designers have taken this into account when planning the new vessel. One deck has been entirely reserved for (multi-language) lectures and presentations in one large observation lounge, with an additional lecture room available for secondary lectures. 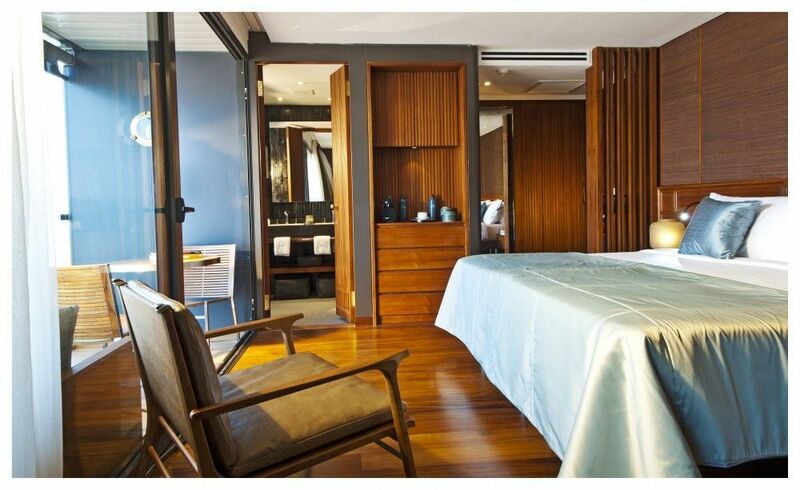 The vessel offers a deluxe standard and at the same time Oceanwide’s distinctive cozy and informal atmosphere. In breaking news, our Canadian partner One Ocean Expeditions has just today announced that they will be expanding their polar fleet in November 2018, with RCGS Resolute joining their existing ships Akademik Ioffe and Akademik Sergey Vavilov. Built in 1993 in Finland and most recently operating as Hanseatic, the 146 passenger Resolute is ice-strengthened to Lloyds 1A level, features modern stylings, excellent facilities and high stability in open water. 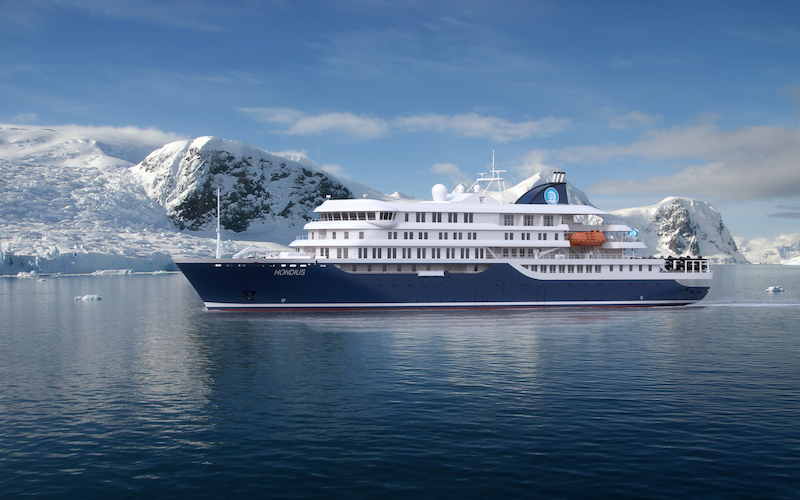 One Ocean Expeditions is currently preparing itineraries for the new vessel, which we expect to be available from November 2017. Keep an eye out on our website for more details as they come to hand. 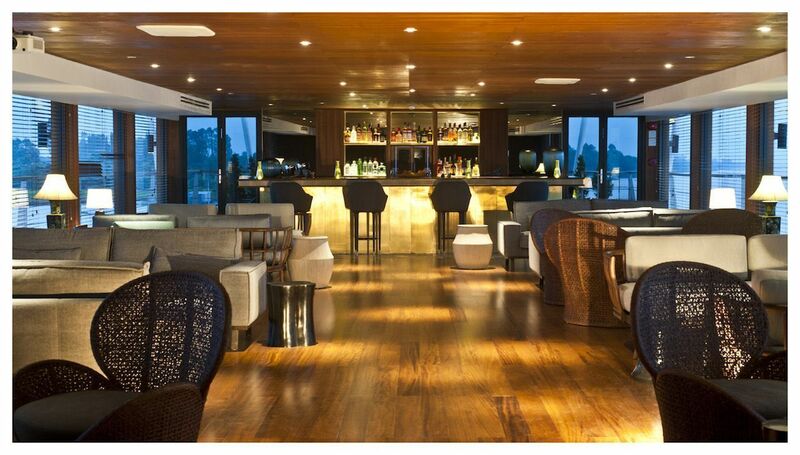 Resolute’s features include two separate bar and lounge areas with breathtaking180 degree views. A well-stocked reading room provides the ideal place to relax or catch up on some reading. Sumptuous meals are prepared for you by an expert culinary team and are enjoyed in either of two dining rooms, one of which features a popular bistro menu offering quick and easy meals for those prioritising time out on deck. Both dining rooms have ample and open seating paired with modern furnishings and large picture windows with 180 degree views. Other facilities include a theatre style presentation room, gift-shop, gymnasium, wellness centre, hot water spa, sauna and steam room and salt water pool. If you’re thinking about an Antarctic cruise, or considering a cruise to the Arctic region to see the Northern Lights, these new ships may offer just exactly what you’re looking for. 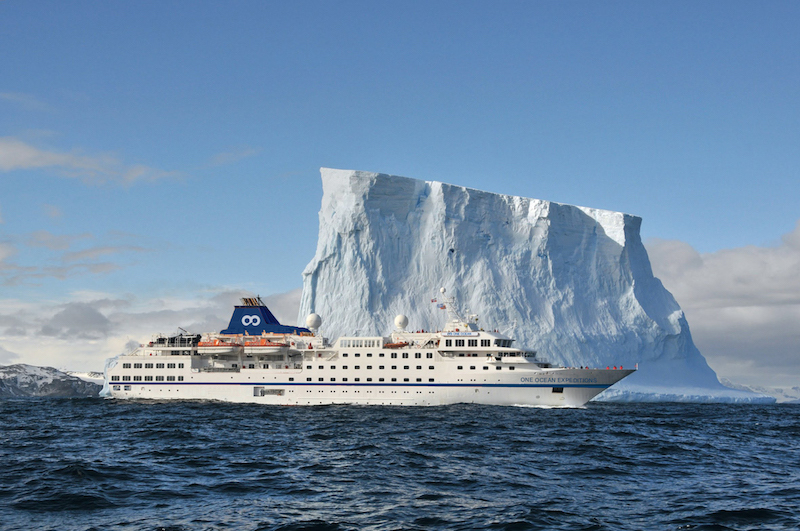 Contact our polar cruise specialists today for more information about our great range of Antarctic and Arctic ships, and our portfolio of the world’s best expedition cruises. 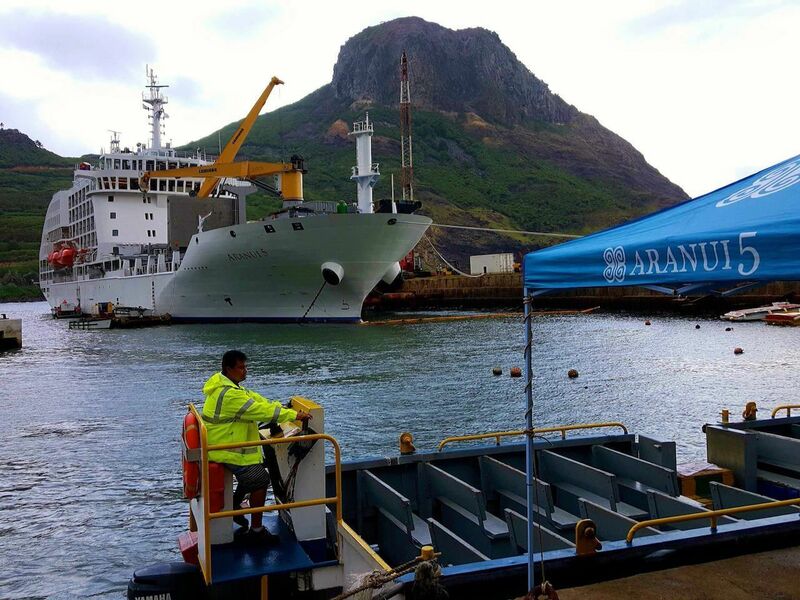 The Aranui 5, a unique half freighter – half cruise ship, will include a visit to the colourful Marquesas Festival as part of its final voyage for 2017. The biennial festival is an important cultural event in the Marquesas Islands, the northernmost of Tahiti’s five archipelagoes. The 2017 mini festival will be a four-day extravaganza of Polynesian music and dance from December 18 to 21, 2017, at Tahuata, the smallest of the inhabited Marquesas Islands. To coincide with the festival, Aranui Cruises’ will make an extended visit to Tahuata on December 20 allowing travellers to participate in a community feast and enjoy the cultural festivities well into the night. 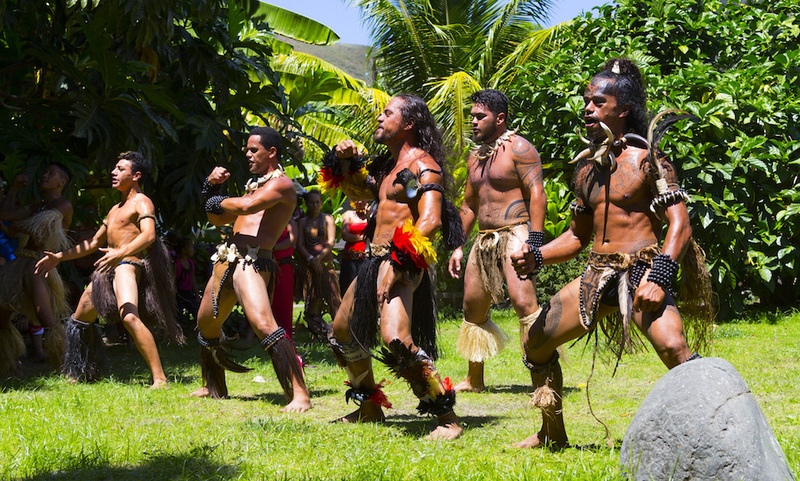 The festival was created to keep the Marquesan culture alive and showcases the vibrant traditions of the remote island group with visitors treated to rhythmical dances, powerful drum performances, games and contests of strength and skill, as well as chanting, sculpting and tattoo demonstrations. As a regular visitor to the far-flung Marquesas Islands, Aranui Cruises are a unique position to showcase these extraordinary islands to the world and there is no better time to visit than during one of their spectacular festivals. As with any major event, accommodation and flights are at a premium during the festival so the easiest and smoothest way to experience the Marquesas Festival is with Aranui Cruises. 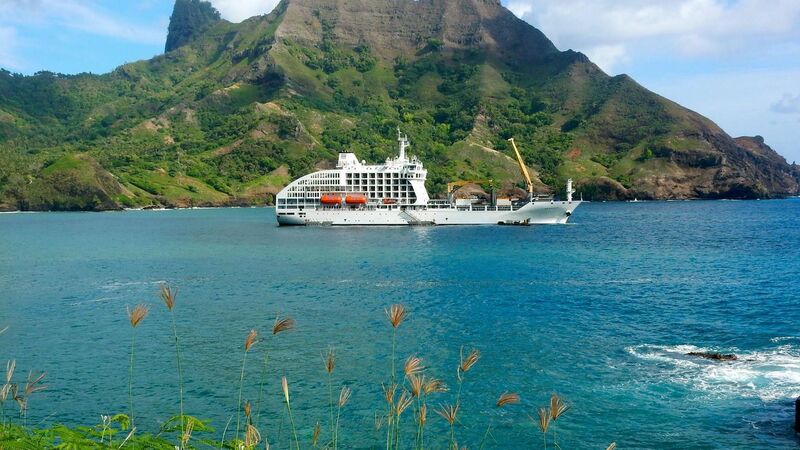 During its 14-day roundtrip cruises from Papeete, the 126-metre long mixed cargo and passenger vessel dispenses cargo while guests disembark and explore nine islands across three striking and distinct Tahitian archipelagoes. Travellers can enjoy Bora Bora and its famed blue lagoon; the chance to walk in the footsteps of Robert Louis Stevenson, Herman Melville and Paul Gauguin on Nuka Hiva, Ua Pou, Ua Huka, Tahuata, Fatu Hiva and Hiva Oa in the far-flung Marquesas; and the picturesque Tuamotu ports of Fakarava and Rangiroa. Departing on December 14, 2017, the Marquesas Festival cruise is priced from $8,670* twin share for a premium suite and $7,970* per person twin share for a superior deluxe room, both featuring a balcony. Aranui 5 also features a restaurant, two conference rooms, lounges, a library, a boutique, a swimming pool, a fitness room, a spa and four bars including the popular Sky bar. "The Ombak Putih voyage was the most marvellous thing I have ever done. I thought I knew Indonesia well, having been travelling there since 1967 and teaching the language all these years, but my eyes have been opened to a different world on this trip on your beautiful boat."